- Hydra-Global Intense Anti-Aging Hydration: 40ml/ 1.4fl.oz. ; Floral Toning Lotion: 30ml/ 1fl.oz. ; Lyslait Cleansing Milk with White Lily: 30ml/ 1fl.oz. ; Black Rose Cream Mask: 10ml/ 0.38fl.oz. 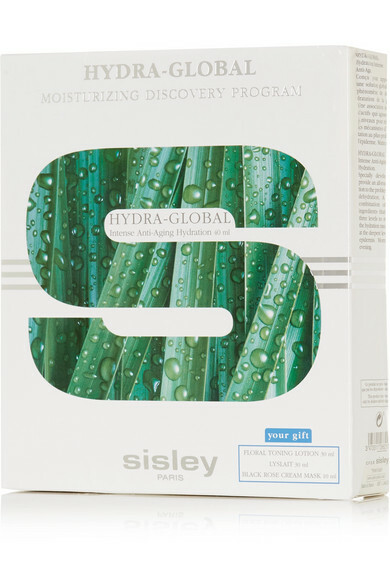 Sisley - Paris' 'Hydra-Global Discovery Programme' nourishes and restores dry complexions for a fresh and more youthful appearance. Each product hydrates and repairs cells, preventing further damage from pollution and the natural elements that dry and prematurely age skin.